Thinking of going vegan, or interested in trying it out? There's no better time than in January—aka. "Veganuary", a global movement that encourages people to go vegan in the first month of each year. Whether it's for better health, animal welfare or the environment, veganism is a rising trend and lifestyle that's here to stay. Tatler 500 lister David Yeung is the founder of Green Monday, a global initiative that encourages people to forego meat at least once a week. He's also behind Green Common, a health food store chain and Omnipork, a plant-based pork alternative that's made of soy, pea, mushroom and rice proteins. His Instagram feed is packed with vegan eats, especially of Asian cuisine, and the occasional celebrity supporter. One of Hong Kong's earliest proponents of green living, Green Queen is a Hong Kong-based platform for all things eco and wellness. Run by Sonalie Figueiras, the "Green Queen" herself, and co-founder Tracy Turo, a data scientist by trade, their feed is populated with bright and vibrant vegan dishes mixed in with zero waste and plastic-free inspiration. Aiming to be "the best local guide to going vegan in Hong Kong", Hong Kong student Eugenia uses her Instagram account to show people how to avoid animal products in Hong Kong, protect the environment and do more good for the world. Her feed features a mix of homemade and restaurant-bought vegan dishes that look equally delicious. Founder and chef of Grassroots Pantry, Peggy Chan is passionate about living a meat-free and sustainable lifestyle. You might recognise her as the cover star of our August 2018 Green issue, alongside fellow Hong Kong vegan David Yeung. Follow her feed to get an inside look at life as a #bosslady at one of Hong Kong's most pioneering plant-based restaurants. Featuring a mix of vegan and vegetarian dishes around town, you'll never run out of ideas on where to eat guilt-free with @herbivore.hk's feed. Each post has a location tag, price range and rating (out of five) so you know exactly what you're in for. With a background in art and design, Joanna (aka. @nourisheats) creates smoothie bowls that are literal works of art. Now training to become a yoga teacher and health coach, you'll find plenty of inspiration on her feed on self-love, ways to detox and of course, how to recreate her gorgeous smoothie bowls. Who knew that boxing and baking could mix? Keikei Yip, a fitness trainer at Hong Kong boxing club Lights Out HK, proves that she can pack a punch in the kitchen as well. Follow her feed (if you dare) for the most drool-worthy and delicious vegan cakes and desserts including vegan pandan cake, chocolate chip cookies and her legendary banana bread. All items can be ordered on baketobasics.com. At just 16 years old, Cheryl is a vegan foodie and talented photographer in Hong Kong. Having collaborated with Mana! 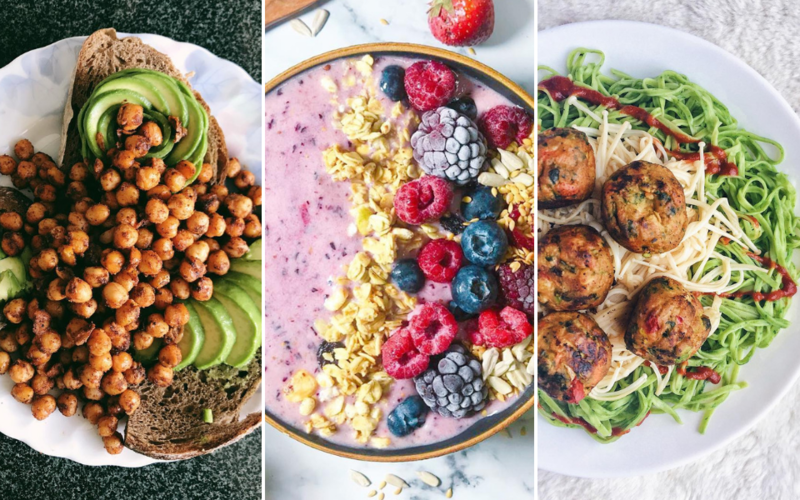 Fast Slow Food and Live Zero, her feed is full of beautifully styled photos of pancakes, flatbreads, cookies, smoothie bowls and more. Based in Hong Kong, Agnes (aka. @eatyoplant) showcases some of the best-looking vegan dishes we've ever seen from Hong Kong, Vancouver and Chicago. From avocado toast to overnight oats, don't be alarmed if your stomach starts growling as you scroll down her feed. Chef Moy is the raw vegan chef for nood food, so expect to find a lot of fresh produce on his feed such as kale, sprouts and even the medicinal Chaga mushroom. It's not just raw ingredients you'll find on his feed though, as he's a coffee and chocolate lover as well. A helpful tool for finding vegan eats in Hong Kong, @veganguidehk posts and reposts pictures of vegan dishes around town, some of which are contributed by followers. Get in on the action by tagging #veganhk or #veganguidehk to join the community. Founded by Des & Yvonne, @pretendhealthy is all about exploring ways to start a healthy and green lifestyle. With a cartoon turtle as their mascot, they're showing Hong Kong that it's okay to take it slow sometimes. Look for beautiful smoothie bowl recipes on their feed and plenty of snack ideas on their IG stories. Run by two Hong Kong-based sisters, this account is not just about vegan eating, but animal welfare and eco-friendliness as well. Inspirational quotes are sprinkled into their feed, which also feature local vegan eats, vegan beauty products and plastic-free inspiration. Focusing on "pretty and practical plant food", Sara Bond (who's a Disney princess in real life with a passion for sustainable food) takes pictures of all the colourful plant-based dishes she creates or comes across on her travels, which include Tokyo, Vietnam and of course, Hong Kong. If you're passionate about living the plant-based lifestyle, fitness and travel, this account is for you. Look for homemade recipes on the feed as well as tips on how to live plastic-free—@littleplantsoul is also a member of @byebyeplasticbagshk, a youth-driven NGO on reducing single-use plastics in Hong Kong.